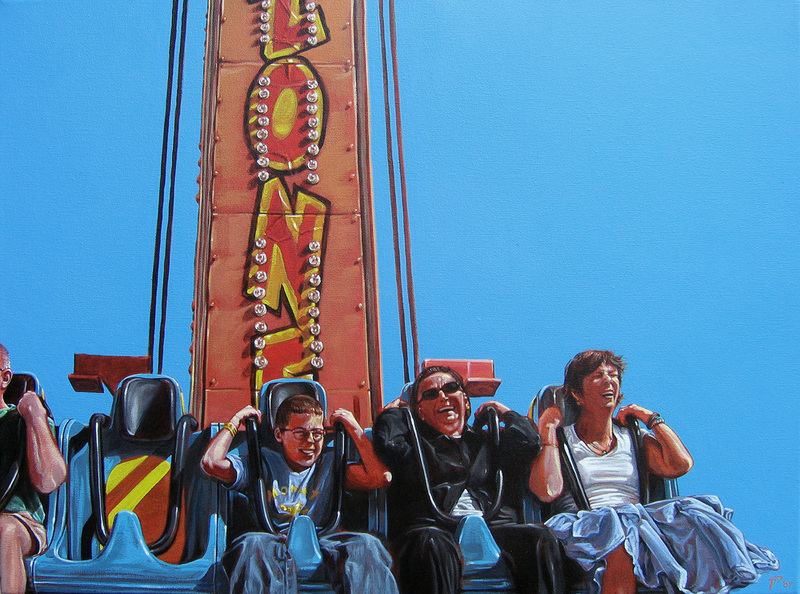 Commissioned work, gouache and acrylic on illustration board, 18” x 13.75” - a close-up variation of an earlier piece. 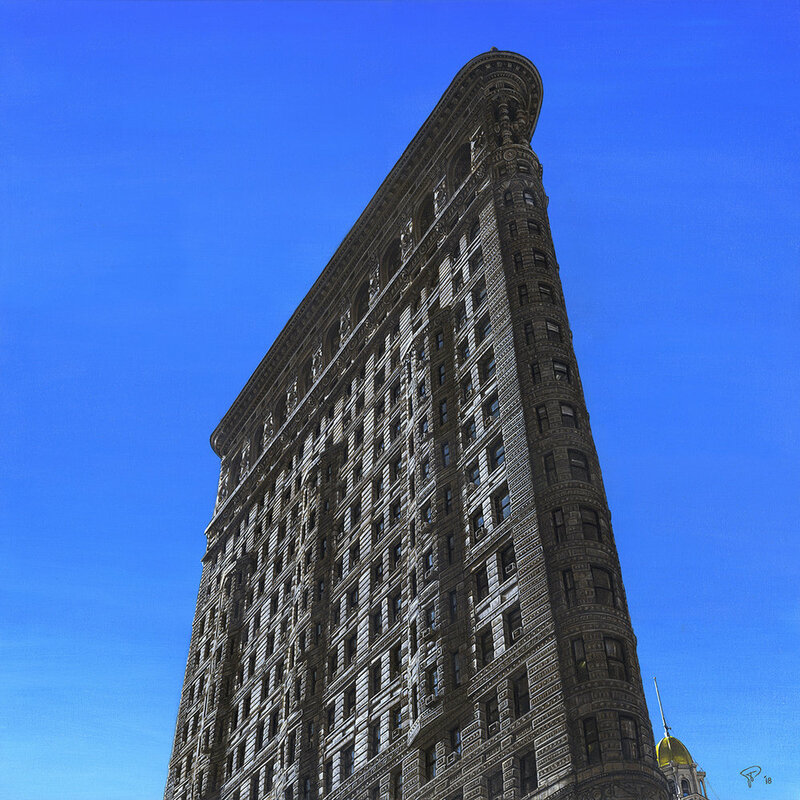 A 30” x 30” gouache and acrylic painting on canvas of one of my favorite structures, NYC’s Flatiron building. A 6" inch square wood panel painting created for the group show, Beyond Ordinary Still Life at the Artists' House Gallery and featured in the Broad Street Review show write-up. 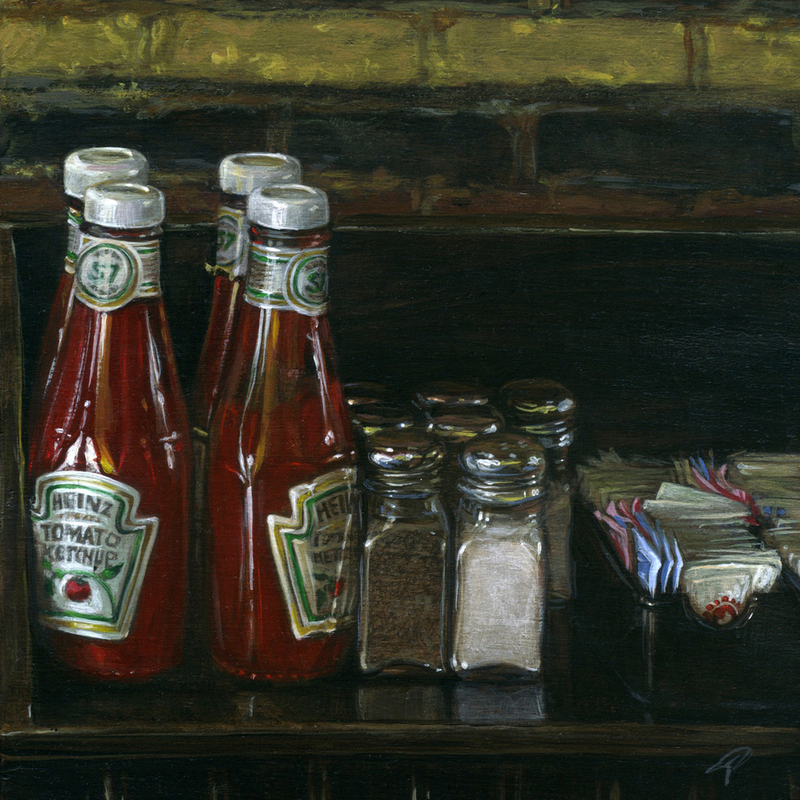 A scene from one of my favorite diners, Dizzy's in Park Slope, Brookyn. 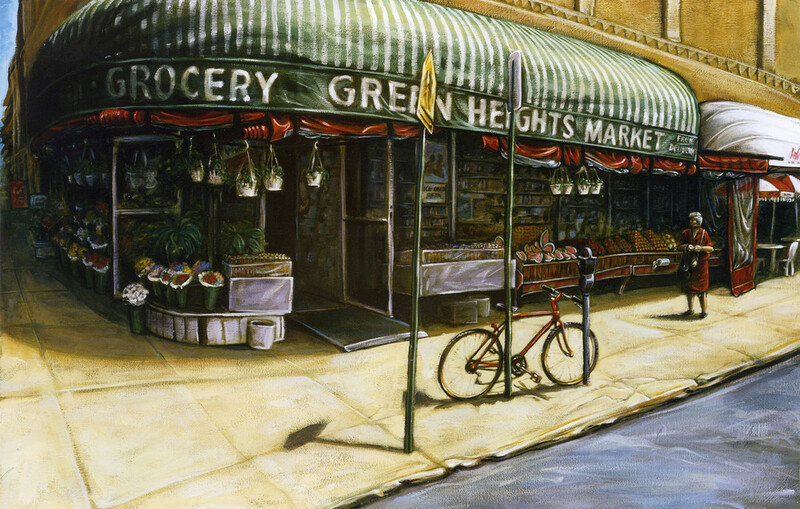 Created for a Small Works show at The Artists' House Gallery. 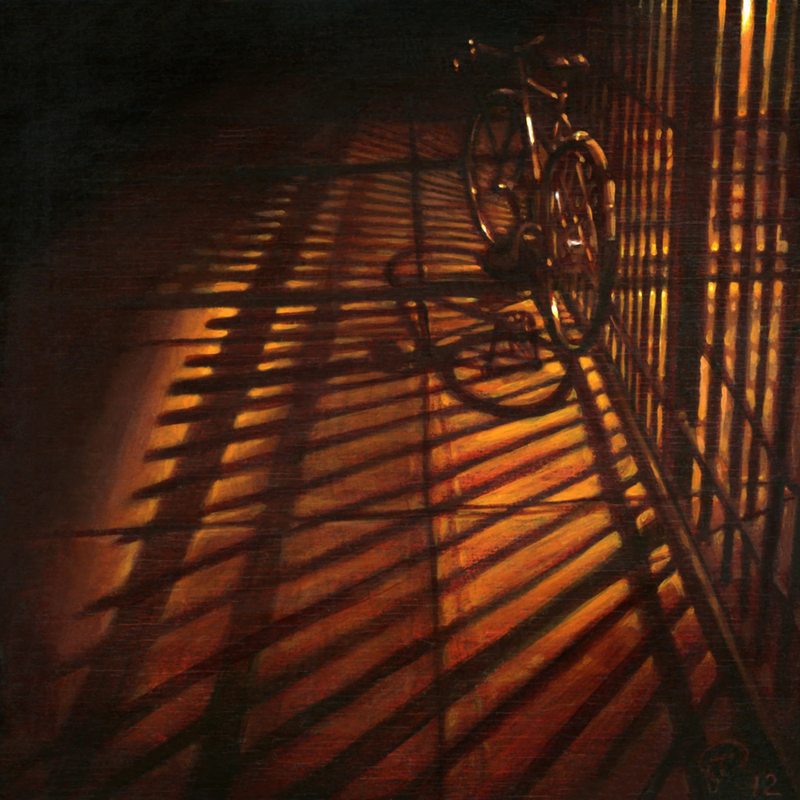 Painting created for A Time and a Place exhibit at The Artists' House Gallery. 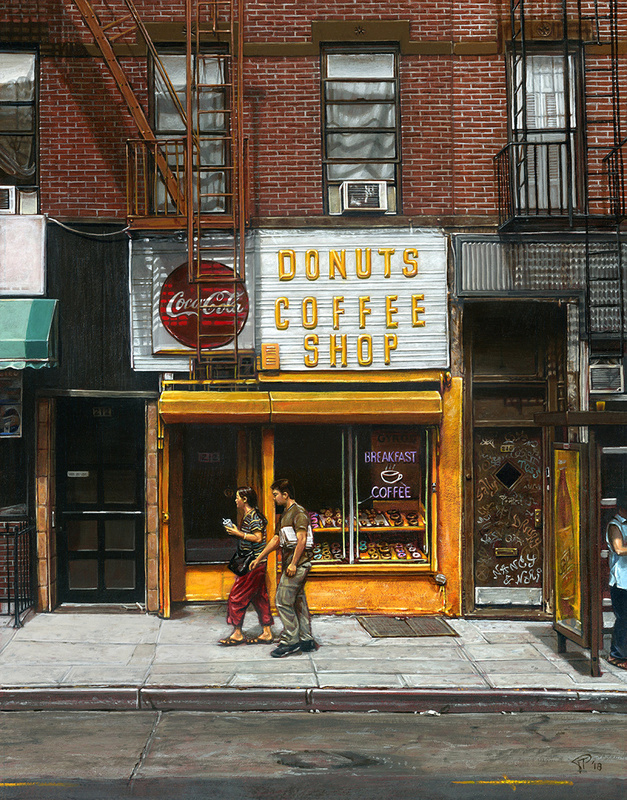 Park Slope's Café Moutarde painted on a wood panel, created for a Small Works exhibit at The Artists' House Gallery. An old pharmacy window in Park Slope, Brooklyn displaying a collection of Whitman's heart-shaped samplers from all the years the business was open. 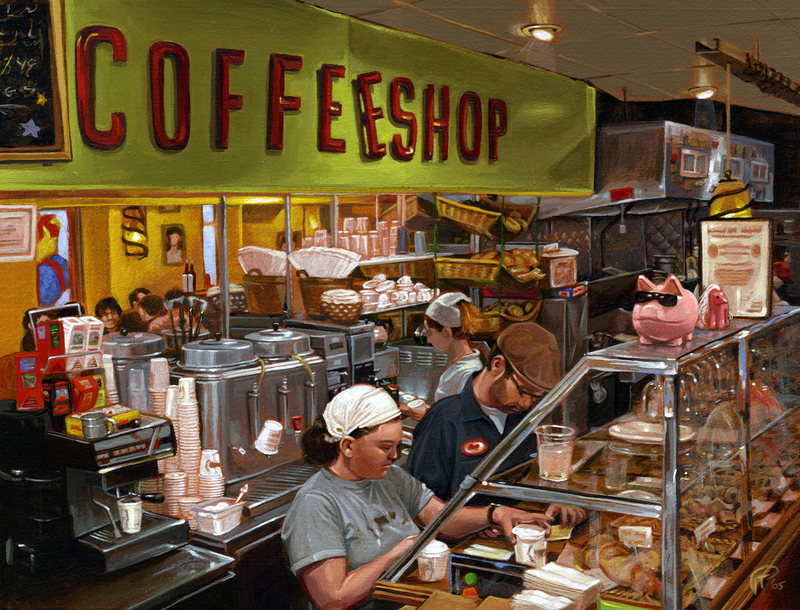 This was done for a Small Works show for The Artists' House Gallery. An image from the town of Soufrière on the Caribbean island, Dominica. Created for a Small Works show at the Artists' House Gallery. 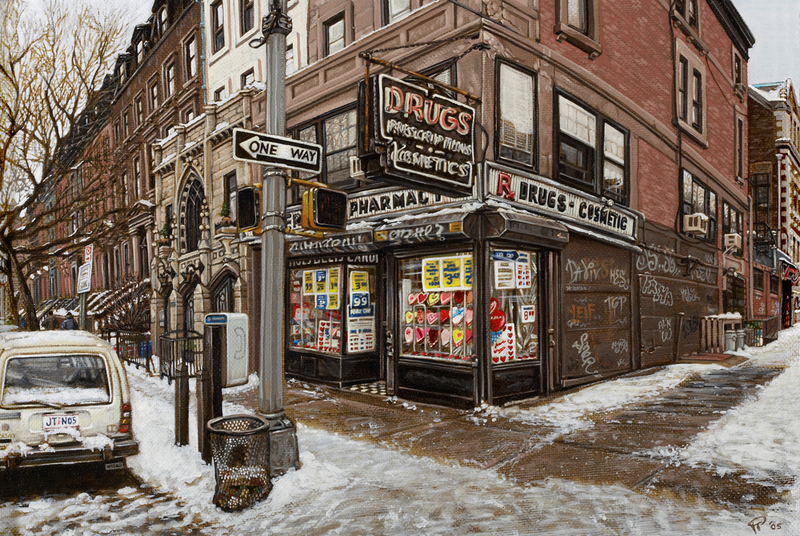 A 6" inch square wood panel painting of a Brooklyn street scene created for a Small Works show at the Artists' House Gallery. 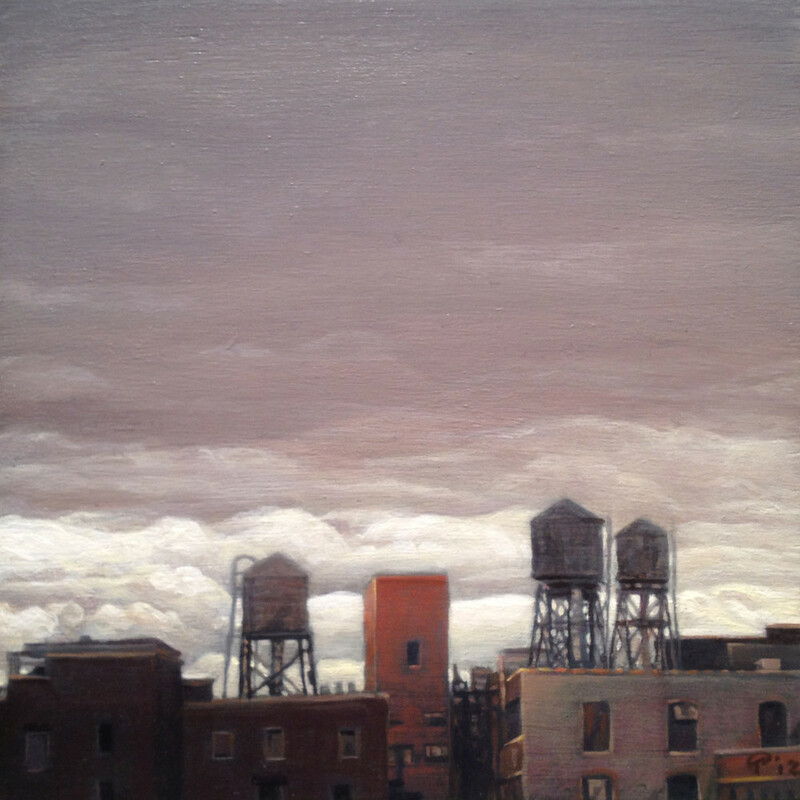 A 6" inch square wood panel painting of Manhattan water towers done for a Small Works exhibit at the Artists' House Gallery. 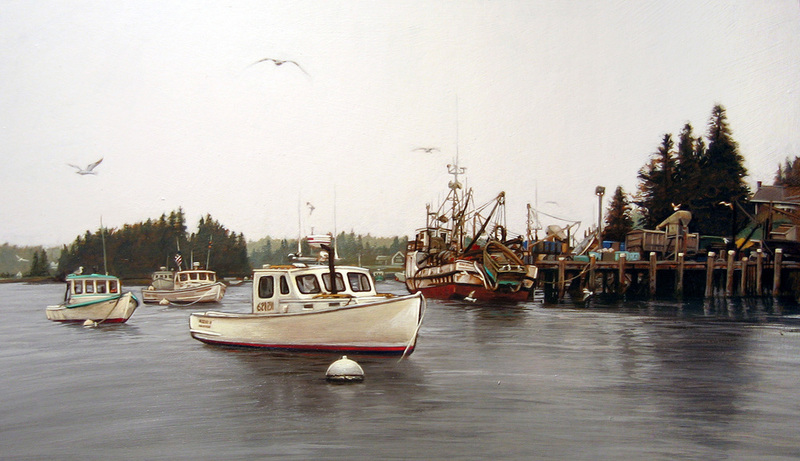 Painting of Port Clyde, Maine created for a Small Works show at the Artists' House Gallery. 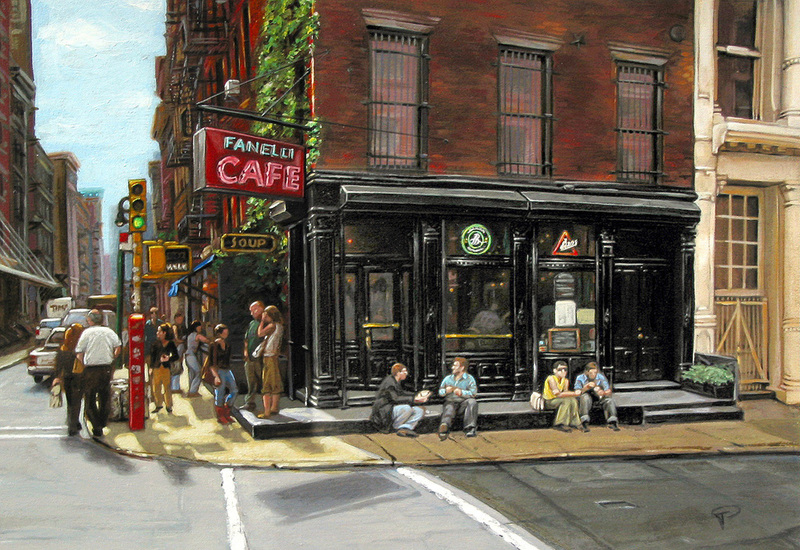 The famous Fanelli Cafe on New York's Prince Street. Commissioned work. 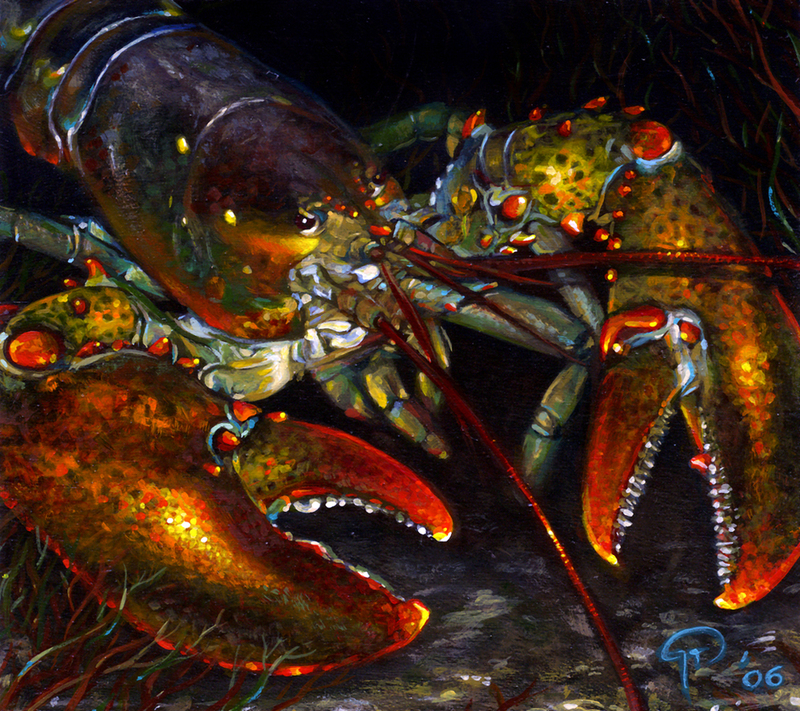 A 4 3/4" by 5" wood panel painting on wood of a Maine lobster done as part of a Primary Fish series that included a Blue Tang and Yellow French Grunt. This was a scene I tripped across when visiting a midtown building. A 6" inch square wood panel painting of a barn in Stonington, CT.
Painting depicting a ride in from Brooklyn to Manhattan on the D subway line. 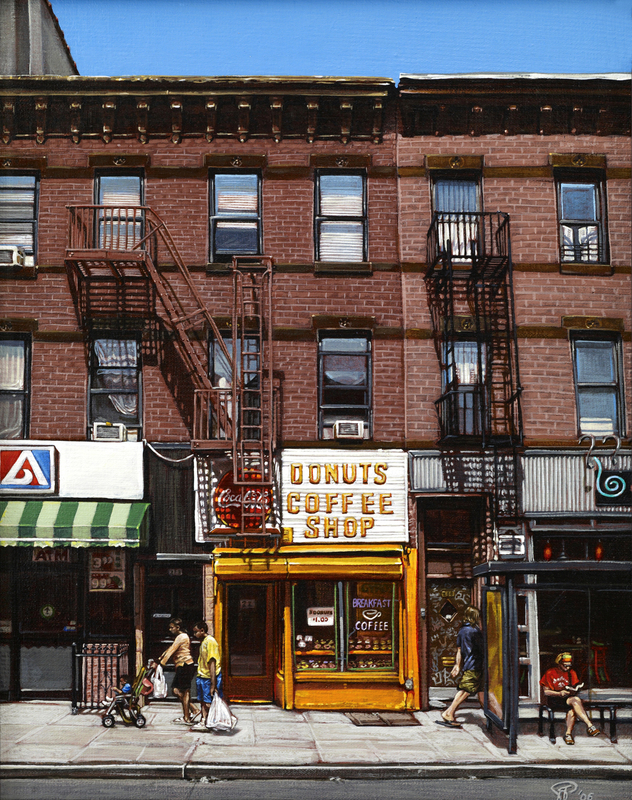 Part of my Disappearing Brooklyn series - a family run donut shop no longer in business. Created for a Small Works show at the Artists' House Gallery. This subject was revisited for a commissioned work in 2018. 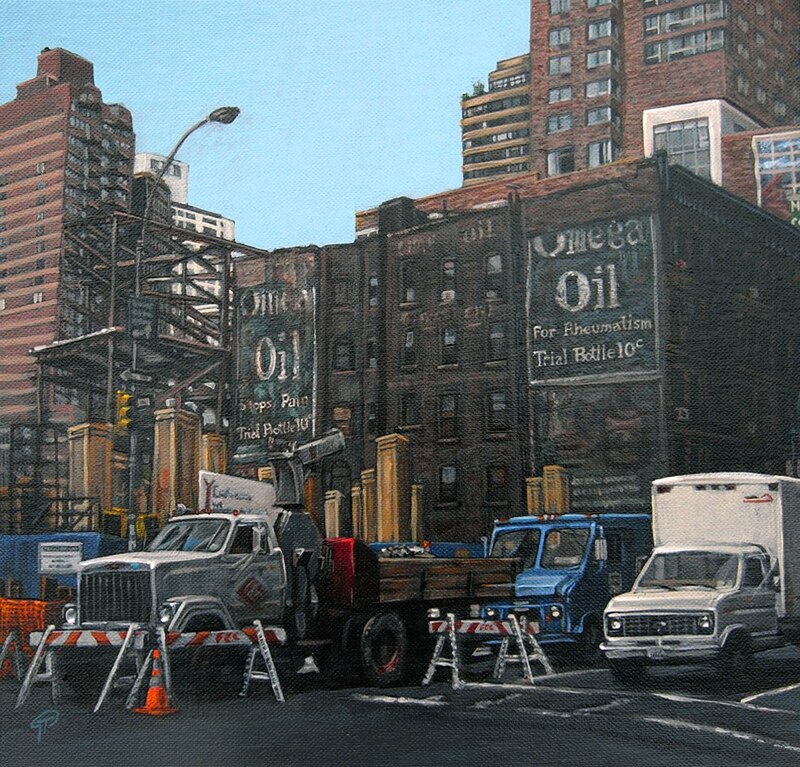 Originally created for the exhibit "Past, Present and Future", this painting depicts actual NYC construction. When tearing down an old building, workers discovered vintage ads painted directly on the brick walls of the remaining buildings. Read about it.